Of course one of the reasons we come to Venice is to get inspired in our jewelry making and bead making. 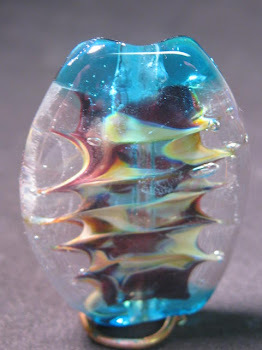 The colors here and the ideas we get from Venetian glass makers and the way they arrange shop windows help our creations. This was a small bowl in the miniature glass exhibit. Sponge purses at the Peggy Guggenheim Museum. We went to see our favorite Venetian glassmaker today, Vittorio Constantini. He is the maestro who makes, in glass, natural wonders. Here's his smile! And as always a lovely canal shot! Wow! !What a nice post.I am inspired from it.can you more share at here.I will come back as soon.